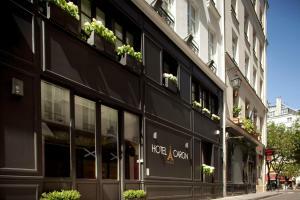 Located near the Place Sainte Catherine and the Place des Vosges, the Hôtel Caron boasts a central location in the Marais District. 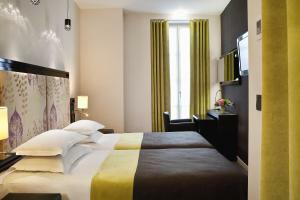 The Picasso Museum is 8 minutes away on foot and Notre Dame Cathedral is a 15-minute walk away. 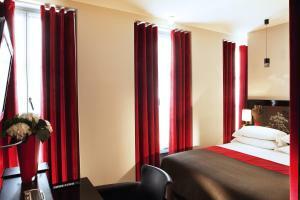 The contemporary guest rooms offer a free minibar, a flat-screen TV and free access to the videos on demand. The en suite bathroom includes L’Occitane toiletries. Free WiFi is available throughout the hotel. Guests can enjoy a buffet breakfast in the hotel's dining room or a continental breakfast in their room. A large selection of restaurants, bars and cafes is available in the surrounding area. Hotel Caron boasts a privileged location and offers easy access to many cultural attractions, exclusive shops and business districts by foot or on public transport. Metro Station Saint-Paul is a 2-minute walk from the hotel and Charles de Gaulle Airport can be reached within 1 hour via public transport from the hotel. Please note that an airport shuttle is available from the hotel to the airport. 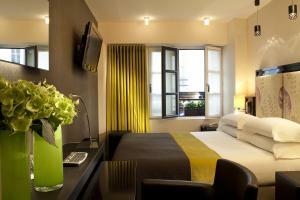 This air-conditioned room has a minibar and a private bathroom with L'Occitane toiletries and a hairdryer. Free internet access and 40 recent films are available on the 32" flat-screen TV in this room. Rate: € 122.33 ... € 196.50; select dates below to get current rates. Rate: € 109.00 ... € 209.00; select dates below to get current rates. 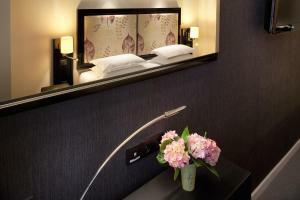 This twin room features a satellite TV, air conditioning and minibar.